Applications are invited for Innovative Student Projects Award 2019 by Indian National Academy of Engineering (INAE) for Bachelors, Masters, and Ph.D. students. 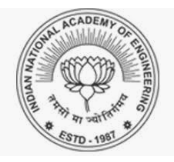 The Indian National Academy of Engineering (INAE), established in 1987, is a ‘Peer’ body of some of the most distinguished engineers in India and abroad. INAE encourages inventions, scientific investigations, and research, and promotes their application for the development of all sectors of the national economy. There is a need to encourage research and development culture amongst engineers during the formative years of their undergraduate and postgraduate training so that they begin their professional career well prepared with ideas and innovative skills. The Academy instituted the above Award since 1998 to identify innovative and creative research projects undertaken by the students in the engineering institutions, and to give an early recognition and incentives to them. Potentially innovative projects/theses are assessed at three levels, viz., B.E./B.Tech, M.E./M.Tech and Ph.D. Nominations for the awards 2019 will be accepted by the Academy according to the following eligibility requirement. Final Year (4th year) B.E./B.Tech projects completed up to June 30, 2019, for the academic year 2018-2019. M.E./M.Tech theses examined from July 1, 2018, up to June 30, 2019, during the academic year 2018 -2019. Ph.D. theses examined and accepted/recommended for Award from June 1, 2018, up to May 31, 2019. It is compulsory that the Degree/Provisional Degree Certificate must accompany the nomination proforma. The Award shall comprise a certificate and Rs.25000/- in cash for the awardees selected at Doctoral Level; Rs.15000/- in cash for the awardees selected at Master’s Level; and Rs 10,000/- in cash for the awardees selected at Bachelor level to each team member, subject to a maximum of four team members. All Innovative Student Project Awardees will also be inducted as “Student-Members” during the Awards Ceremony in INAE Annual Convention. The Student -membership is valid for a period of five years. Only one nomination for projects/theses in each of the Engineering Sections of INAE listed in Serial 7 of the Nomination Form, at each level, viz., Doctoral, Master’s and Bachelor are accepted from an Engineering College for assessing their innovative potential and intrinsic merit. Sector 49, Sohna Road, Gurgaon, Haryana (India) – 122018. The nominations must be sent by Principal/Deans/Heads/Registrar/Director of Engineering College where the candidate has carried out his project/thesis for the award of the degree and not through the organization where the candidate is presently working. The last date of the receipt of nomination is July 7.